Fanie grew up in the 60's almost next to Wonderboom Airport which in those days was not much more than a dirt strip with the PLACO Hanger and a mielie field where 11/29 today is. Fanie and his friend, Gerald van der Woude spend many a afternoon playing between the rows of miellies but mostly they could be found at the fence, watching wide eyed as the aircraft departed and landed and marvelling at the antics of some of the pilots. There and then he decided that one day he too would be a pilot. After leaving school Fanie started work at the Pretoria Fire Department but since money was tight his dream of flying was deferred. In 1970 he applied for a position as a Cabin Attendant with SAA. His application was successful and he at last realised his dream of flying, albeit as a passenger and for the next 14 years he spend thousands of hours in the air and seeing the world. Attending to whims of passengers only took up some of his time, the rest he spends in the Jump Seat, observing and learning. In 1984 he left SAA and rejoined the Fire Brigade and at long made his dream come true when he started his PPL with Cedric Mew as his instructor. Fanie then started looking for an aircraft and he was told that a Jodel was for sale and always having had a soft spot for Taildraggers and in 1984 he bought ZS-UJM. The Jodel was built by Nantus van der Merwe in the late 70's and when Fanie bought it, it had a severely damaged main spar. Before he could do any work on it, he was required to join the EAA (the Experimental Aircraft Association the governing body of homebuilt air craft) and he has been a proud member ever since and was a founder member of Chapter 871. The damaged Jodel was taken to Rustenburg where he restored it completing the repairs in 1986 and it was painted in its distinctive Red and became known as the Green Frog. Fanie and the Jodel became a well-known participant at air shows and EAA get-togethers. In her old colour scheme. Fanie can easily be recognized wearing his distinctive Red jacket that he bought in 1986 at Margate during the annual EAA Fly in. Every year since a new patch was added on and today the jacket festooned with patches of all the aviation events he has attended, each patch telling its own story. On the 4 July 2004 The Green Frog was totally destroyed when the engine failed on a flight to Baragawneth and Fanie spend almost four months in hospital recuperating. The engine and some other remains of UJM were salvaged and Dale de Klerk and Piet Smith who also found the radio and headsets and these today are still used by Fanie in the reincarnation of UJM. In 2005 Fanie was told about a partially build Jodel F12 at Brits Airfield and he made an offer that was accepted and the project was transported to Boksburg where the rebuild, using some of the remains of the Green Frog, commenced. 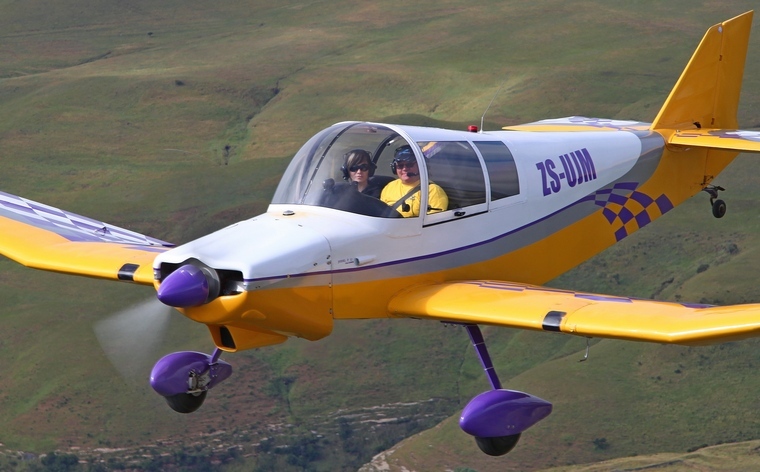 It took Fanie four years of weekends, holidays and evenings and with the help of many friends and Piet Fourie of the CAA the distinctive yellow and purple Jodel took to the skies from Heidelberg Airfield in July 2010 for its test flight with Jan Kemp at the controls. Fanie currently have logged some 1900 hours of which about 1400 are in the Jodel, the rest on several other types mainly in the Piper range. Pride of place though belongs to the Gusty A60 a uniquely South African designed and built aircraft that used to reside in Kriel in Maphumalanga and is now being restored by Fanie. Powered by a standard 1800cc VW with the prop bolted directly to the engine the Gusty, registered as ZS-XXY only one of its type completed. The Jodel was the brainchild of Frenchmen Edouard Joly and his son-in-law Jean Delemontez who shortly after the end of the World War Two designed a range of light aircraft. The popular myth is that the two had no formal aerodynamics training however Delemontez was a trained aeronautical engineer and his father-in law, Joly, had designed and build an aircraft before the outbreak of war. The first Jodel was the D9 Bebe (Baby), an all-wood, single seat aircraft with cranked wings powered by the Poinsard engine. More than 500 Bebe's were build, most for the French Government which expressed interest in a larger aircraft and the D11 designed to meet the French Governments requirements for a aero club trainer followed in 1950. The structural and aerodynamic features of the Jodel are quite sophisticated as shown by the robustness and performance of the distinctive cranked wing aircraft which is 6.2 long and the 8.2 wingspan have a wing area of 12.7 m2. It weighs 340 empty and has a useful load of 280 kg and depending on engine type, popular power plants are the Continental A65, A75, C85, C90 and O-200 has a maximum speed of 210km/h. The Jodel cruise comfortably at 190 km/h, stalls at 50 km/h and has a range of about 900km. Fanie's Jodel has spats fitted and the features a smoother canopy and windshields and it cruise at 190km/h take off in 250-300 meters and climbs at 800 ft per minute. It is the passion for aviation of Fanie and likeminded aviators that keeps the EAA growing from strength to strength. Many thanks to CC Pocock for expertly flying the chase plane during the annual EAA Fly-in at Volksrus whilst Fanie formatted on us for the photo shoot.